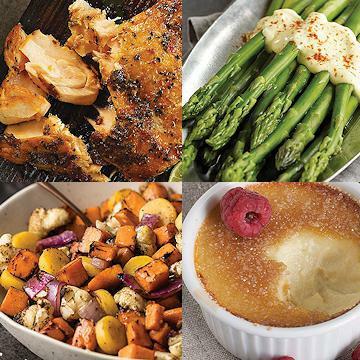 This unique gourmet package comes with four marinated salmon fillets ready for the oven or skillet, crisp asparagus spears with Hollandaise sauce, a colorful melange of roasting vegetables, and creme brulees in ceramic ramekins for dessert. Thaw in refrigerator.Remove fillets from plastic wrap. Bake: Preheat oven to 400 �F. Place salmon fillets on a foil lined baking sheet. Bake for 10 to 12 minutes. Grill: Grill salmon fillets over medium heat 4 to 5 minutes per side. Microwave:Place salmon fillets in a microwave safe dish. Cover with plastic wrap, venting one corner. Microwave on high 3 to 4 minutes, rotating halfway through cooking. Do Not Thaw. Oven: Preheat oven to 450�F. Remove vegetables from packaging. Spread in single layer on a rimmed baking sheet. Toss with 1 tablespoon olive oil, � teaspoon salt and ⅛ teaspoon ground black pepper. Roast for 25 minutes until golden brown and tender. Microwave (1100 Watt): Remove vegetables from packaging. Place in a microwave-safe dish. Toss with 1 tablespoon olive oil, � teaspoon salt and ⅛ teaspoon ground black pepper. Cover with plastic wrap venting one corner. Microwave on HIGH 3 minutes. Carefully peel back film; stir. Microwave an additional 1 � minutes or until tender. Do Not Thaw! Microwave: Cut slit in center of film. Place tray in microwave; cook on high for 3-4 minutes or until internal temperature reaches 165�F. Carefully remove film and serve. Oven: Preheat oven to 350�F. Carefully remove film from tray before baking. Place tray on baking sheet on oven center rack. Bake for 35 minutes or until internal temperature reaches 165�F. Remove from oven and serve. Oven Broil (Preferred method) DO NOT THAW: Preheat broiler on high setting. Position top rack 3-4 inches from the broiler element so that the top of the Creme Brulee will be 1-2 inches from the broiler element.. Remove seal and plastic lid from ramekin and place on baking sheet. Sprinkle one package of sugar evenly across each Creme Brulee. Place Creme Brulee under broiler element for 4-6 minutes or until the top is golden brown. Remove from broiler and let Creme Brulee stand 10-15 minutes before serving. Thaw and Serve (Alternate method): Thaw overnight in refrigerator. Remove seal and lid. Serve cold. Sugar packet is not used for this method of serving. Ingredients: Atlantic Salmon, (Color Added), Marinade, (Canola Oil, Olive Oil, Water, Salt, Spices, Dehydrated Garlic, Paprika, Dehydrated Onion, Dehydrated Red Bell Pepper, Autolyzed Yeast Extract, Natural Grill Flavor, Natural Smoke Flavor, Citric Acid And Natural Flavor). Contains: Fish (Salmon). Ingredients: Asparagus, Water, Butter, (Cream, Salt), Nonfat Dry Milk, Modified Food Starch, Dried Egg Yolk, Soybean Oil, Salt, Dried Lemon Juice (Maltodextrin, Natural Flavors (Lemon Juice Solids)), Mono-Diglycerides, Xanthan Gum, Natural Butter Flavor (Maltodextrin, Natural Butter Flavor, Annatto & Turmeric (for color)), Spice, Annatto (color). Contains: Milk, Egg.